Intel has used the IDF summit to call for PC and component makers to step up the pace when it comes to EFI implementation. 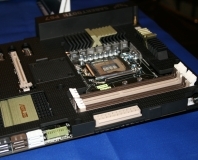 EFI stands for Extensible Firmware Interface, and is the replacement for the standard motherboard BIOS (Basic Input Output System). The benefits of EFI are numerous. It eliminates the need for a master boot record, thus eliminating viruses which operate in that sector. It allows for capacities of bootable disks over 2TB - which, given the available of 750GB drives right now that have RAID capabilities, is a good thing. EFI also boots faster. Since the system config is stored as a file, it also means you don't have to hammer F1 on startup to adjust options. All Apple's Intel Mac systems ship with EFI, but adoption by motherboard makers has otherwise been slow. Intel is pushing manufacturers to get on board in time for Vista, which natively supports EFI.